I have tried a fair few of Heston’s Waitrose products and overall they tend to be pretty damn good. In fact I’d say out of all the celebrity endorsements he tends to come out on top. To be fair he probably has more products than anyone else and so his chances are increased but he rarely disappoints. He doesn’t always live up to the promise on the label and some things could be improved upon, but apart from these, most things taste good. So it was with this back catalogue of Heston knowledge that I embarked upon some vanilla bacon. To me vanilla bacon does sound pretty weird, and it doesn’t sound particularly nice but Heston tries to reassure, with the following message “Because as kids we encounter it in desserts we think as vanilla as sweet, but it’s not. It has a delicate, fruity, spicy and sometimes earthy character, depending on where it’s grown.”. Heston has covered his bases there and if the bacon happens to taste fruity, spicy or earthy all well and good, only if the bacon tastes sweet do we have something to worry about. When the packet was opened a big waft of vanilla came floating out, and I’ll be honest, it smelt pretty sweet to me. No matter into the frying pan it goes, sizzling for a few minutes til nice and crisp. It looked delicious and when I took a bite, it tasted delicious too. 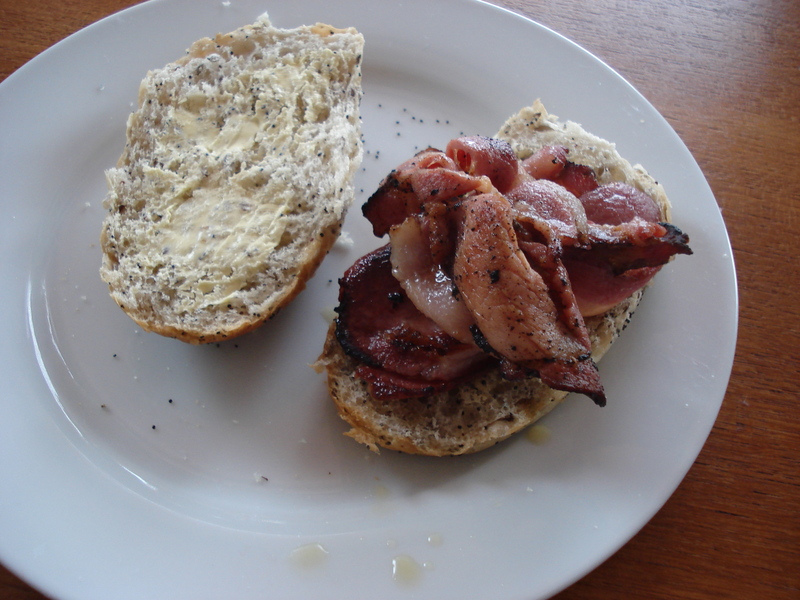 It was top quality bacon, possibly saltier than your average slice but really good – I do love bacon. There were a few characteristics that this bacon did not exhibit however: fruity, spicy, earthy and sweet. Yes it was delicious bacon but it was completely devoid of anything but bacon flavour, which is no bad thing, but not what was promised. I had almost finished mine and Naomi was a good two thirds through hers when she let out a cry… “Woah! I just got a big hit of vanilla!”. So it seems our entire vanilla quota was lurking on the corner of one rasher. I asked Naomi how it was and she answered “It was OK” so it doesn’t sound like I missed out too much after all. 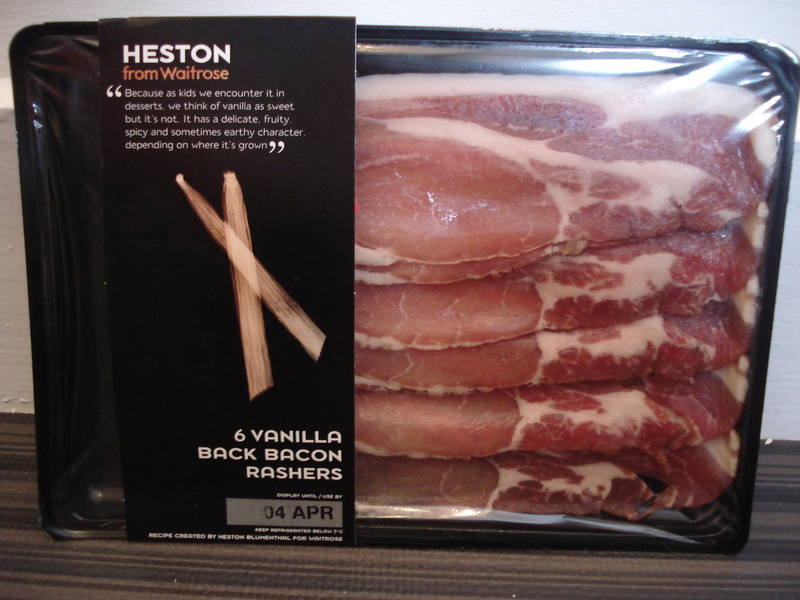 Heston’s vanilla bacon, well worth a purchase if you want some delicious top quality bacon. Not really worth it if you’re looking for vanilla. This entry was posted in Uncategorized and tagged crispy bacon, Heston Blumenthal, vanilla, Vanilla Bacon, Waitrose. Bookmark the permalink.